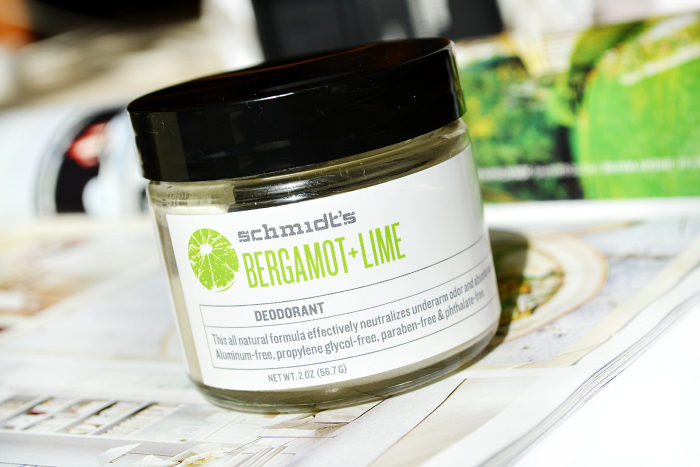 If you follow a number of green beauty blogs, I'd be surprised if you hadn't heard of Schmidt's Natural Deodorant yet! There's definitely been a bit of a buzz around this brand, with plenty of bloggers across the pond touting these deodorants as some of the best they've tried! My first introduction to Schmidt's was with a sample pot of the Lavender + Sage scent in July's Petit Vour box, and soon after I received a shiny silver package with their Bergamot + Lime Deodorant*. Firstly, I have to say it smells totally amazing; just like a stronger version of sherbet lemon sweets! The deodorant itself is kind of a dry solid paste in consistency. To use, you scoop a small amount out of the jar with the spatula provided, warm it up between your fingers and apply. I've found the best way is to roll it up into a ball until it starts to get tacky and soft. It's pretty tricky to get the hang of at first as the deodorant flakes into little pieces when you scoop it out of the jar, so it does require a bit more effort than a quick and easy roll-on/stick deodorant. It's worth mentioning that the formula contains baking soda which can cause irritation for some people. Personally, I experience mild irritation if I use this every day but I have no issues using it every other day. In terms of effectiveness, this deodorant works well for me. I don't generally sweat much though, so I got my other half to be a product tester again (he did a little review before here) and he agrees it really does work to keep the smells at bay! He loves the scent and the look of Schmidt's packaging, but isn't so much a fan of the extra effort it takes to apply. We're both thinking it would amazing if Schmidt's made a deodorant in stick form as it would be so much easier to apply! Schmidt's Deodorant are based in the US, but they're available internationally from a number of retailers (see list here). A full size deodorant jar costs $9.00/approx. £5.50 and they also sell smaller travel size pots at their Etsy store. Have you tried Schmidt's Deodorant before? What's your favourite natural deodorant? This looks interesting! I've been trying a lot of different natural and organic deodorants, but failed to find one that actually works.. But I'm intrigued to try this one now! I have the same Bergamot & Lime one but have yet to test it out…definitely will be soon though. I love the scent! Great review! I received the bergamot & lime scent. I like it, I dislike the whole pot thing... I'm just opposed to using pots for products. I love the scent, but I found that this was drying and irritated my skin a bit. But, like you said, if used every other or every couple of days, it was fine. Yeah it definitely takes some getting used to and having to alternate days isn't always ideal! Oh no, maybe it just doesn't mix well with your body chemistry or something! You're the first person I've heard it doesn't work for! I haven't tried this one yet but heard so many rave reviews apart from Stinky Sarah ;) (just kidding if you read this Sarah aha!). At the minute I'm using the one I won in Nuciya giveaway from Routine but it isn't as good as the one I tried from Etsy!